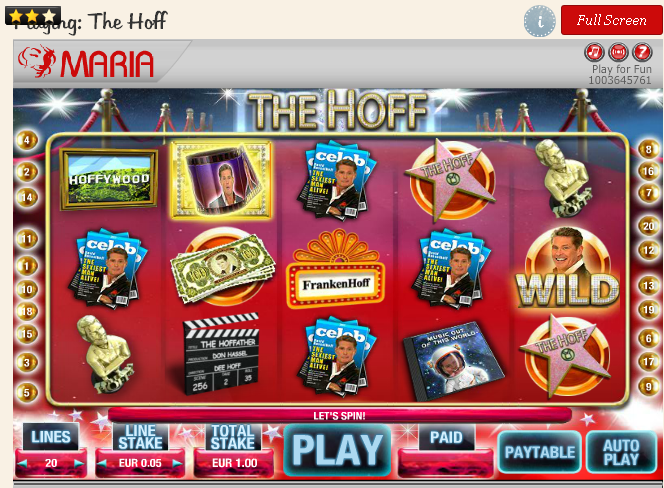 There's a familiar face arrivedin the huge slot line up at Maria.com - he's tall, he's tanned, he's had dubious plastic surgery – the Hoff Slot is new in town. Mr Hasselhoff nestles side-by-side with 13 multi-million pound jackpot slots such as Arabian Nights, Spiderman, and the Fantastic Four, along with dozens of fruit machine classics, video poker games and keno. Simply for signing up, you'll get five free spins to play on the Starburst game – you'll find the free spins credited to your account automatically. Got a competitive streak? 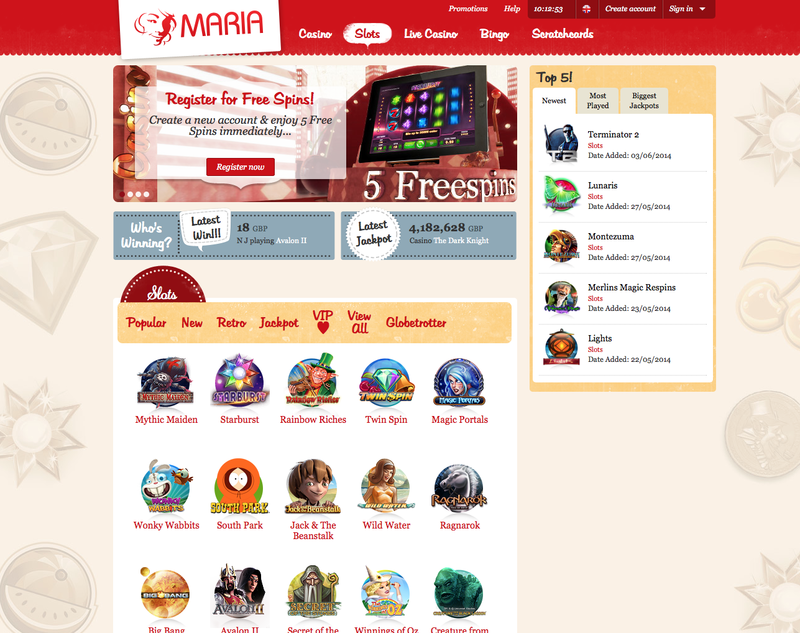 Maria is the home of intense daily slot tournaments – they run from midnight to midnight, and usually consist of one game. To win a tournament, you must play a minimum of £20 to qualify, and climb to the top of the leaderboard to win a first prize of £100. Entering the tournament is free, and all you need to participate is a real money account. Daily tournaments have a £210 prize pool, but keep your eyes peeled for weekly and monthly casino tournaments with much larger prize pools. As fun as tournaments are, be careful to keep an eye on your spending, and don't let it get out of control, simply to chase a relatively small cash prize. Maria has links to the relevant gambling charities should you find you're developing a problem. One account every gives you access to 75 ball and 90 ball bingo, casino, lottery, poker, and live casino – let it be known that this site is much, MUCH more than your average bingo site. Also at time of press, a player called Crazygoose had recently won £101,643 on the 7 Gold Scratchcard, showing Maria players are no strangers to whopping wins. There are hundreds of titles to choose from, and if you like your franchise games, you'll be right at home – titles include Dallas, Madness House of Fun, the Wizard of Oz, and of course, the Hoff. The Hoff is a star-spangled showbiz machine, featuring film reels, Hoff memorabilia, and stars on the Hollywood walk of Fame. With three bonus rounds, cool interactive videos, and a handy autoplay mode, should you feel too posh to push the spin button, this slot is certainly the superstar of the Maria.com lineup. The Ruby Slippers Wizard of Oz game comes from software house WMS. It's based on the famous film, and you can play from 30p to £60 per spin. Click your Ruby Slippers to enter the bonus round, and when the good witch Glinda appears, you'll get a 10 x multiplier. This mesmerising game is packed with clever bonus features such as the Find the Broom, which is triggered if you find two or more feature symbols. Most of the slots can be played in demo mode – this is perfect if you're a beginner, or looking to get to grips with the bonus levels before you deposit. You can play any game in Fun Mode, even if you logged out. To enjoy the games at their full potential, you need to have the latest version of Macromedia Flash, and Java. If a game is sluggish, or you experience problems, ensure you have both programs up-to-date. Should you have a problem with a game, contact Live Support, giving them as much detail as possible – exact time of play, the stakes, and if possible, a screenshot. This will improve reaction time and problem analysis. Maria is guaranteed 100% safe and secure, and is endorsed by eCOGRA. Maria Is Operated by UniBet International, with registered offices in Malta. Licensing is provided by the Lotteries in Gaming Authority. Visa, MasterCard, Click and Buy, ewire, Neteller.